As we all know, NUFC derive support from all over the north east, with many more fans coming from further afield some even flying in from foreign lands, all are welcomed to Newcastle with open arms. However, there is one group of Magpie fans who not only have to hide their allegiance in their home city but also have to deny where they live once they reach Newcastle. Who are these unlucky people, after all we are a friendly club rightly proud of our reputation for Geordie hospitality, yes I’m talking about those of us who, through whatever circumstances, have found ourselves to be Newcastle fans living in Sunderland. As for myself I was born and raised in Blyth, my dad took me to St.James’ Park for the first time in 1968 to watch us lose 4-3 to Man City, they won the league title that day, but that didn’t interest me. 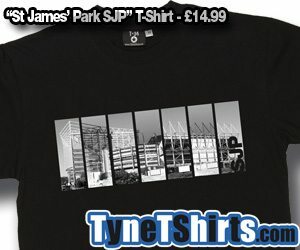 I had found my heroes and a near 50 year love affair with the Toon was born. Wembley in 74 and 76, Johnny Rep for Bastia, the relegations of the 70s and 80s , play-off heartache against the mackems, being locked out for years during the ‘Entertainers’ years (apart from the odd cup game or mate’s ticket),the joy of getting my brand new season ticket for Level 7, following the toon to Turin for the match with Juve, the downs and ups of the Mike Ashley regime – I’ve been through it all. There is however, one event that happened during that time which was to have a profound effect on not only my love life but also on my toon supporting obsession…yep, I met and married a mackem lass, not only that but a season ticket holder to boot (her dad and brother had them as well). Now as everyone knows, it’s always the bloke that moves, so that is how I found myself in 1979 living and working in Sunderland and having to sneak off to Newcastle on my own to watch the lads. I have to say that in the intervening years I developed a bit of a siege mentality, even though I made lots of good friends in Sunderland, I was always the outsider who supported the team they called ‘the scum’. However, despite the rather predictable disappointment of both my kids growing up as Sunderland fans, (even though I managed to take them on the odd trip to St.James’ Park) my fortunes were about to change. Out of the blue I received a call from Richie, the man who was to become my co-season ticket holder, a young man whom I knew to be a toon fan, he had a spare ticket for the toon v Derby and did I fancy it, the rest as they say is history. Nowadays the match day experience goes something like this; Richie knocks on my door (we live quite near each other), can’t really wear my colours as we have to walk through the Bluebell car park to get to the metro, anyone who has been to an away match in Sunderland will know the pub. Probably have a pint in the Mill View club before the journey. Once on the train we generally make eye contact with our fellow 5th columnists (I personally know a half dozen season ticket holders currently residing in enemy territory). After that it’s Yates’ for the matchday lager special, this season it’s Carlsberg for £1-79(!) a pint then into the ground, half time pint £3 f*****g 80, days going well, but once the match is finished that’s when we have to be careful because despite whatever toon supporting credentials you may have, living in Sunderland is a no-no, so we have to be very careful not to give ourselves away. Sad I know but it is true and I have the bruises to prove it. Don’t get me wrong, I’m not complaining as it comes with territory but please if you do meet me in the toon after a match don’t kill me for an accident of geography. If you would like to feature like Dave on our/your website, get writing, ‘The Blog’ is where we profile contributions from anybody who has something to say. Send in your opinions/hopes/fears(! )/articles and we’ll put them up on the website for everybody to enjoy.